In many communities across the United States, basketball is a common sport. It doesn’t take much effort to convince children to play it. Many of those children may even see themselves as one day becoming a major player for the New York Knicks or the Miami Heat. Yet, 29-year old Ian Thomas-Minor, who played college basketball, is inspiring kids to invest in their future by having a back-up plan. Last summer, Minor hosted the First Annual Battle in the Bluffs, a two-day free basketball camp and tournament that encourages kids to consider what they need to be successful in basketball and use that in their everyday lives. 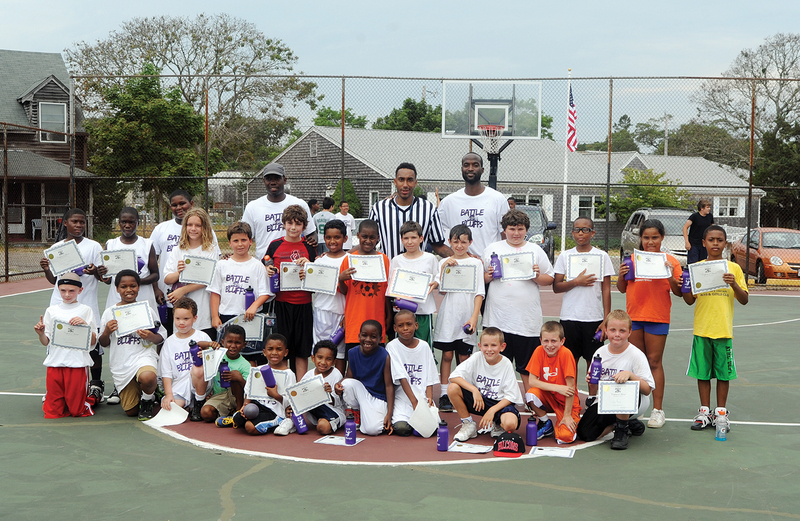 The camp and tournament, a first attempt by Minor to provide children on the island of Martha’s Vineyard with positive lessons he learned in basketball, is a product, which stems from Minor’s own experiences in basketball. A Communications major, who graduated with a BA from Molloy College, Ian Thomas-Minor and his business partner, Arthur Andrews, who also played college basketball and graduated from George Washington University with a Finance degree, began developing the project a few years ago after reminiscing with other basketball players about the tournaments they had attended as younger men. It wasn’t long before Minor began to put his ideas into motion, and with Andrews working behind the scenes, the two of them held the successful event in the summer of 2012 that saw more than fifty youngsters attending. During the event, there were guest speakers Gary Deberry, a former Queens College basketball player who now works on Wall Street. Deberry spoke to the children about how to excel in more than just sports. This understanding is crucial according to Minor, who says that children must be taught practical skills. Minor call this ”an act of love”. Minor, who has spent much of his life either visiting or living in the town of Oak Bluffs, Massachusetts on Martha’s Vineyard, thought it would be the perfect venue for the tournament. Both Minor and Andrews believe that this prepares kids for a diverse workplace when they become adults. After learning lessons on basketball, teamwork and life in general from the speakers, the children spend the last day of camp playing basketball in the early part of the day, and then watching their new mentors play in an adult tournament. This arguably gives the children a chance to see the coaches put their own ideas into practice. When choosing his coaches, Minor didn’t only reach for friends to act as mentors for the kids, but recruited family as well. Both of his younger sisters, who have played college ball and are recent graduates, were coaches at last year’s game. His youngest sister, Kia Minor, who just graduated with a BA in Education, has coached kids in summer camps for the past several years. Hailee Minor, who graduated with a BA in Sociology, describes herself as a ‘proud little sister’ after seeing what her brother was able to accomplish. Yet, Ian Thomas-Minor doesn’t see the camp as his own accomplishment, but as a vehicle to show kids what they can accomplish. Minor is confident that there will be plenty of support from the Martha’s Vineyard community this year. 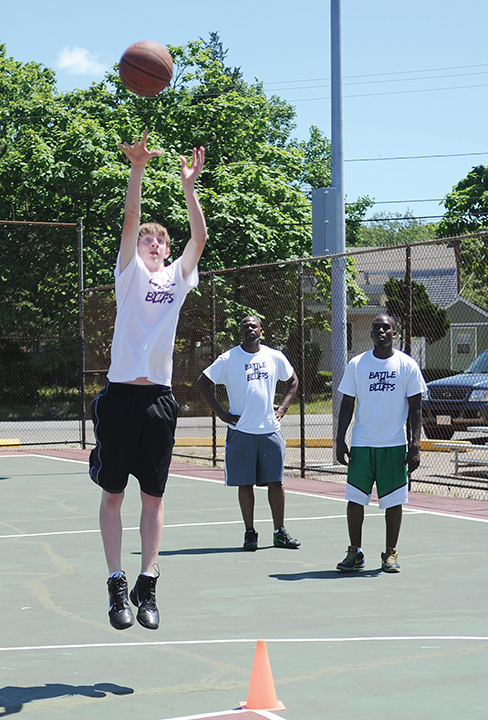 The Second Annual Battle in the Bluffs camp and tournament will take place on July 5th and 6th in the town of Oak Bluffs in Niantic Park. For more information about the camp and tournament, please visit battleinthebluffs.org. To donate to the event or to volunteer your time, please contact Ian Thomas-Minor or Arthur Andrews at (917) 291-9401. Yes. Guilty as charged. It has been quite a while since our last post. One of the most difficult aspects of starting your own magazine is the wait. Sometimes, you are simply waiting for some important detail, piece of information or financial option to come through. In the case of Aspot, we are waiting for all three. This can be really frustrating, especially when you believe that the momentum of hard work is what will get your magazine produced. Yet, a friend reminded me recently that once you have begun to put things in motion, don’t get thwarted when things don’t seem to be flowing. Instead, imagine that even when you feel disconnected from the creative process, the tasks you set into motion are continuously moving. Today I thought to myself: Self. What can I do in the meantime that would at least make me feel that I am using my energy in a productive way towards the betterment of the magazine. My Self answered. Enter YOU TUBE. So lately, I’ve been checking out You Tube a lot. I play this game on You Tube I like to call Spin the Video. I began by putting something in the search bar like “Jazz Vocalists” Then I click on suggested videos until it brings me something I like, letting one video lead me to a list of others. Usually, I strike gold. But why would I do this. Well, let me remind you that A-Spot Mag is dedicated to highlight unknown and emerging artists. You see the connection? So instead of twiddling my thumbs with impatience, I’m going to blog about some emerging artists on You Tube. In fact, a section of the magazine may very well be dedicated to finding talent on You Tube. At the moment, it would seem that You Tube is still the most popular video-sharing website in existence. In the past year, I have found some amazing performances on the site that I would love to share with you. 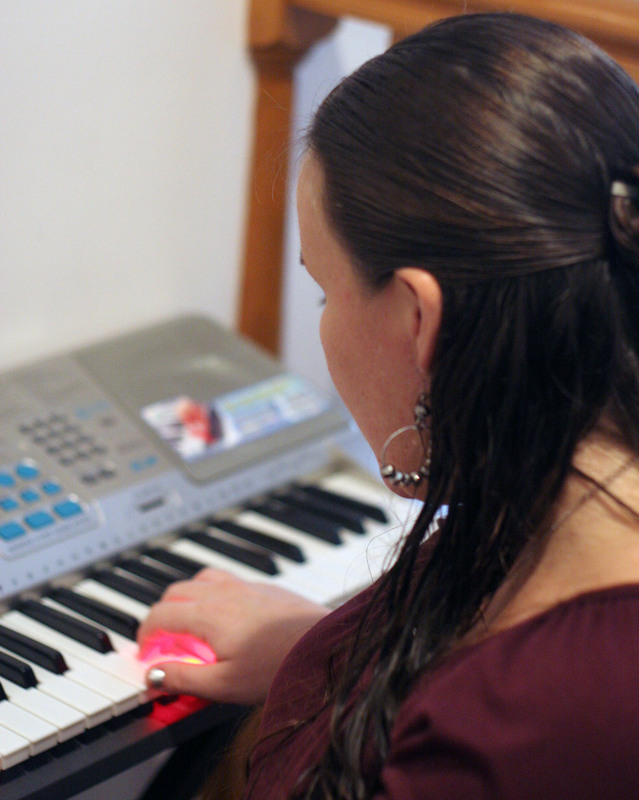 I recently had the privilege of interviewing a family that has incorporated music in their lives the way that other families engage in Saturday morning chores. 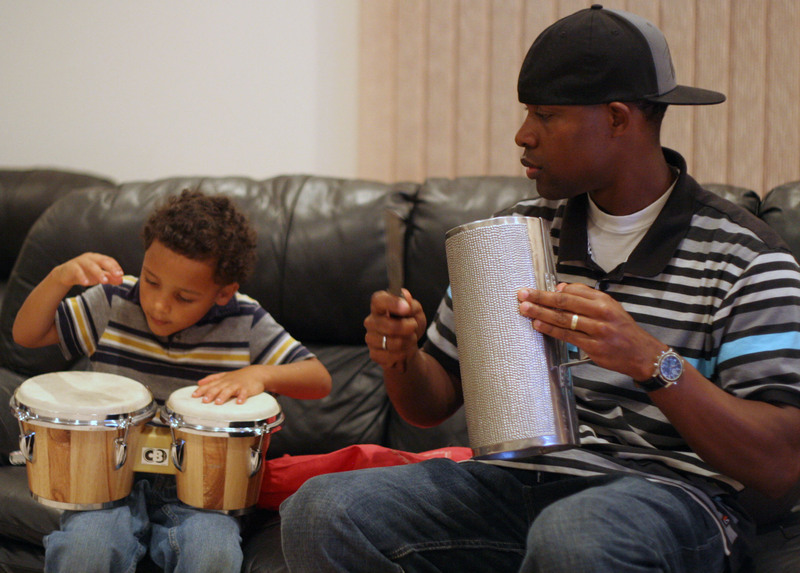 It was so moving to see 3-year old Joshua Roman play the congas. During the interview, his parents Billy and Havilah talked about the importance of encouraging children, but refraining from directing them too much. The conversation reminded me why A-Spot Magazine is so important to me. I realized that music is a communication, a way of expressing one’s feelings, ideas and perceptions. As I watched Joshua, I realized that he enjoyed communicating with the congas. Maybe for a 3-year old, it’s more important. Even an adult sometimes does not have the vocabulary to express complex feelings. A child certainly does not. But if a child can use music to tell a story, then much less goes unsaid. control the way an idea develops. I feel like my dream is taking shape and watching it morph into something that I hadn’t fully imagined is just a gorgeous experience. That experience was amplified by the eight drafts of logos presented to me by artist Guy Thomas yesterday. Each offered something deliciously compelling and beautiful. Ladies and gentleman, the dream has a shape and a name. And soon that combination will be presented to you in a visually striking way. Hi (Hello), I’m Guy. I am an artist working on A-Spot. My first task is (has been) the design of the magazine logo. I need to share that I have been instantly challenged by being involved in an accident that took place over the Christmas holidays of 2011. The incident resulted in 2 surgeries and a recovery period that will probably span 9 months–a time of serious pause. But with challenges also came gifts. One of the gifts was a space of gratitude that I experienced for the people and things that have been in place during this trying time. Another, unexpected, gift came to me as I brought my attention back to A-Spot. That gift was a more intimate trust in the organic process that gives rise to my art and craft. So, in your mind’s eye, picture me positioned close to a set of glass patio doors letting the outside light (daylight) in—I am seated with one leg in a cast and the other in a brace, and both legs propped up on a cushioned stool—I have a 11″ x 14″ sketchbook across my lap, pencil in hand, Coltrane’s “Love Supreme”playing in the background, as I patiently wait for the muse. I did manage to present Candice with a draft that we were both pleased with. I am continuing the process to provide a selection that we may choose from. I, too, am excited by the possibilities and grateful that I can still do this. It’s really amazing how once you put a dream into motion, it seems to attract what will inevitably be small parts that make the whole project work. Let me explain. After a lifetime of living in major cities like New York and London, I find myself living in southern New Jersey in order to be close to my parents. Be assured that I am pretty much living in the country. If any of you live out in the sticks, you have a uncomfortable familiarity with insects. Suffice to say, the exterminator was called because ever so often insects decide that they would much rather live in your house rather than the outdoors. So Billy was called to come exterminate. And, well, it turned out that my parents were right about Billy. He and I connected immediately and talked for a good half hour. Imagine how surprised I was to learn that besides speaking four languages fluently, the Dominican Republic native also plays four different instruments, has a wife who plays keyboard and a three year old son who plays the congas. Bowing to the serendipitous nature of this event, I asked Billy could I interview his family and he agreed to bring them over soon. So there you have it. Bug extermination turns out to be an opportunity to interview a family of musicians. Who would have thought? Welcome to A-Spot Magazine’s blog site. I’m here to write my experiences as I launch a magazine that will profile unknown fine artists, dancers and musicians, and really anyone who is willing to express themselves artistically. You may ask, “Why unknown artists?” The answer is simple. It is because well known artists don’t need us. And also, there are simply not enough venues and events supporting unknown artists. So myself, my current staff and my future staff all hope that anyone reading this will want to join us in this cause and support us in any way you can. For now, I simply ask that you allow me to take you on a ride that is sure to be both bumpy and fruitful. You see, I’ve never done this before. That is, I have never started an online magazine of this caliber. And though I have been trained by professionals in the areas of creative writing, web design, international journalism, and magazine production, we could probably all agree that putting knowledge into practice is quite a different thing. So stayed tuned folks. Learn with me. Cry with me. Inspire me and let me inspire you. Dream with me, and let’s just see what happens. Perhaps something miraculous.